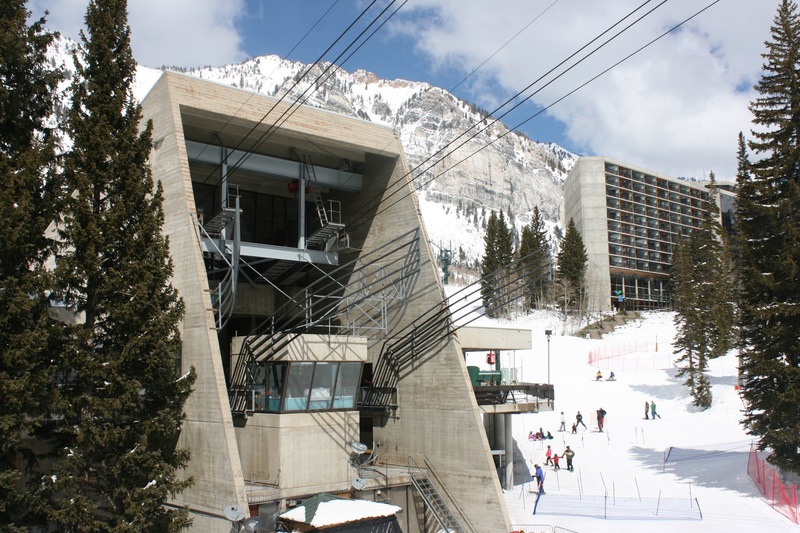 Architecture of Snowbird, Utah | ride. travel. live. I’ve been to Snowbird a handful of times, and aside from the amazing terrain, powder snow, and views, I was very interested in the buildings scattered around the base and the mountain. These are period pieces in classic Brutalist style, conceived in the mid-1960s and completed in the 1970s. 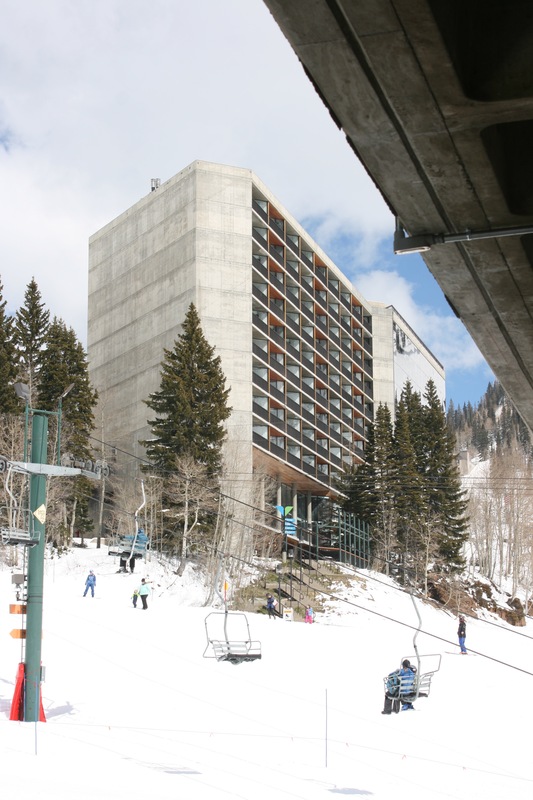 Despite the seeming mismatch of lots and lots of concrete and wood, they strangely fit into the landscape, avoiding the often unexceptional, derivative nature of architecture at ski areas. Now architecture is normally not what one thinks of when going skiing, but I had to pause and explore some of these buildings in closer detail and loved what I saw. I’ll also say a bit about the snow, my visit was timed with a moderate snowfall, with up to 6 inches accumulating overnight, and since some areas were closed until the avalanche danger eased, there were plenty of fresh tracks to be found. The crowds were minimal, despite being on a weekend, and there was no waiting in lines. The weather even cooperated on my second day there, as the sun came out. It’s a steep mountain, with lots of high speed lifts, and I probably got nearly 20000 meters of vertical over the course of two days. Fun! Incidentally, I purchased a Mountain Collective pass, which has been a good investment this year, especially now that the snow returned to the West. The Road to Provo from the summit of Hidden Peak. The buildings are Brutalist, with no attempt at hiding the modernist roots and the architecture in vogue in the 1960s and 1970s. They reminded me of Louis Kahn, with the blend of concrete and wood, but are mixed in with plenty of dark, reflective glass. The master plan was completed in 1966, and the buildings were completed between 1971 and 1973, designed by Enteleki, Architecture, Planning, Research, and Brixen and Christopher architects (closed 2016). The best building is probably the mid-mountain lodge, designed to withstand the elements, but also graced with wood beams that blend with the trees, and plenty of windows that allow for views of the mountains. Designed by Enteleki and completed in 1971, it looks clearly 1970s in the color scheme, but has weathered the 45 years very well. The entrance is a bit awkward though, with a ground level entrance splitting the lower level in half, and stairs lead up to the lodge level. The base tram terminal shoots out of the ground like a church, but is a simply designed, logical structure that expresses exactly what it does. It’s unadorned form following function. Lower tram terminal, with the Cliff Lodge in the background. Closeup of the Cliff Lodge. So even the distinguished architectural photographer Julius Shulman dropped by and took photos, it was that good! 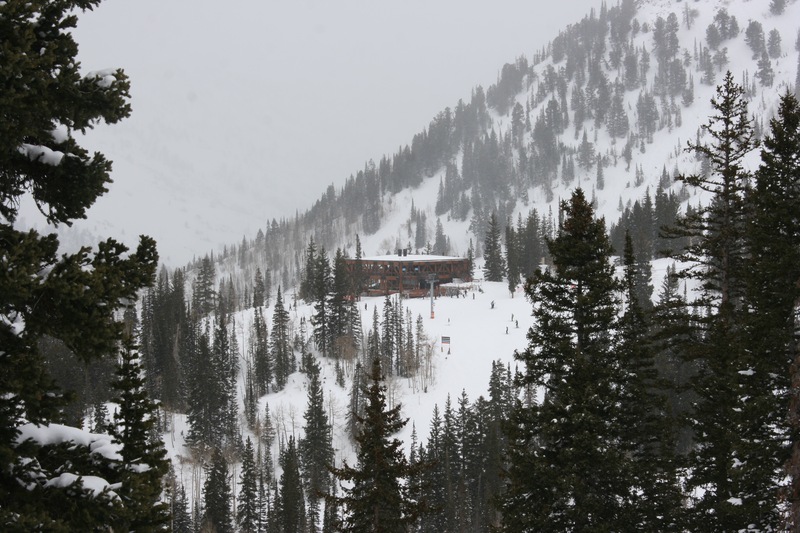 At the top is the Summit at Snowbird, which opened on 26 December 2015, and is the least distinguished structure, resembling a bunker. 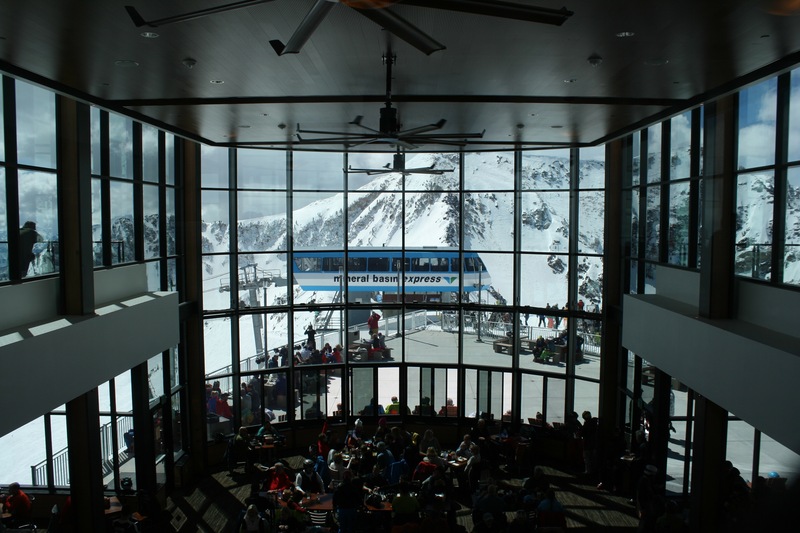 The views from the balconies and from behind the reflective glass are amazing, but it stands out like a sore thumb on the summit of Hidden Peak. The restaurant and seating is nice, though, serving healthy food with a touch of class and even linen tablecloths! 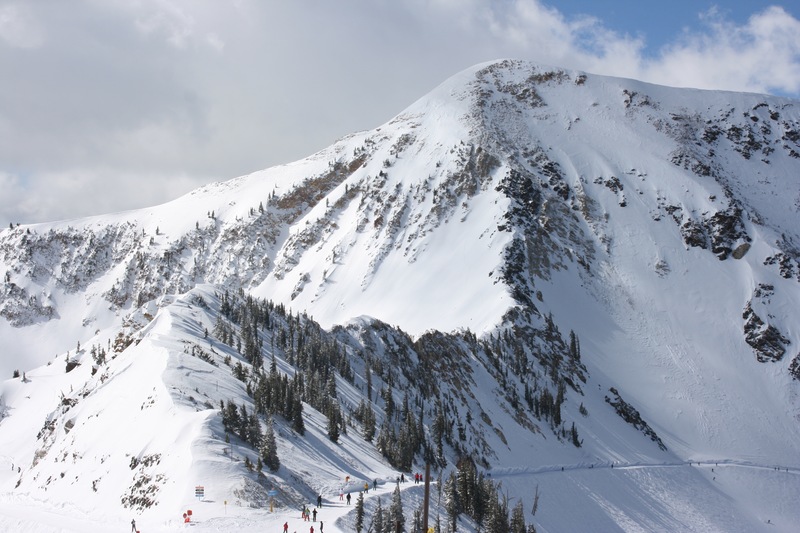 It does provide a necessary stopping point at the junction of the upper tram terminal and the Mineral Basin lift. This “entry column” evokes the concrete architecture of the other buildings, but the materials don’t quite fit in. View from the Summit at Snowbird, not a bad place to have lunch. And the logos and fonts, they evoke the 1970s as well, large and clean, with the Snowbird “triangles” logo imprinted into many of the structures. This is a great 1970s period piece and remains fresh even today. An excellent page with more info and photos can be found at the Salt Lake Modern website.